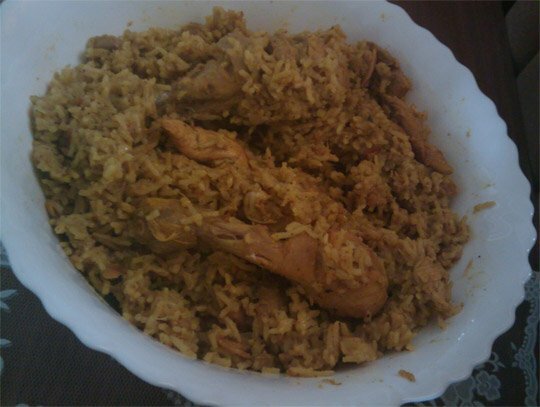 Chicken Pulao is a rice preparation with chicken pieces marinated in ginger, garlic, cashew nuts, almond and some garam masala and cooked with coconut milk. Thus the recipe is full of different flavors and aroma. The preparation is pretty easy too. Grind together all the ingredients for the marinade and marinate the chicken with it. Leave it aside for at least 30 minutes. Wash and soak rice in little water. Add some oil into a pressure cooker and put on a medium-high flame. When oil is hot add bay leaves and sliced onion. Lower the flame to medium and saute till onion turns light brown. Then add the marinated chicken, stir and cover and cook till chicken is almost cooked (around 10-15 minutes) stirring occasionally. Later uncover and cook till chicken mixture is dry. Drain the rice and add to it to the chicken mixture. Stir and roast for few minutes. Then add coconut milk and stir again. Cook uncovered for 2 minutes. Then add lemon juice and mix well. Sprinkle some cashew nuts over it, cover with the lid and pressure cook upto two whistles only. When the pressure drops, transfer to a serving bowl and serve hot with raita. 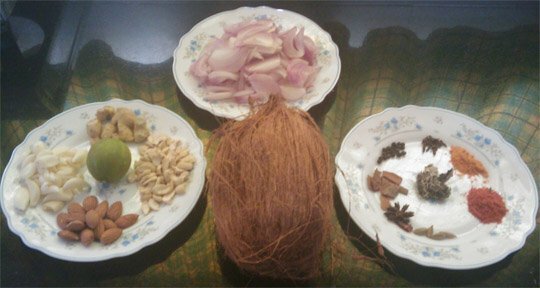 Coconut Milk – To extract milk from fresh coconut, grate the coconut and then strain it from a thin cloth. Try extracting as much coconut milk as possible. This milk will be much thicker. Do not throw away the strained coconut. Add some hot water to it and keep it aside for few minutes. Repeat the straining process again. This milk will be little thinner than the earlier one. But you can mix both and use in this recipe. You can also use coconut milk powder to prepare milk. But fresh coconut milk tastes good.